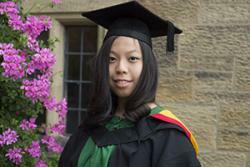 A prize-winning student graduated from Bangor University this week. Not only did Yi-Wen Lim, 21, from Luxembourg graduate with a BSc Biology degree, she was also awarded the Pen y Ffridd prize of £100 which is awarded annually to the best final year student in botanical studies. Very pleased to have graduated, Yi-Wen said: “It still feels quite surreal to have graduated as the last three years have passed by really quickly. “It feels amazing to have my work recognised as I have put a lot of time and effort into my studies and I’m really grateful and honoured to receive this prize. “I grew up in Kuala Lumpur until I was 13, and then my family moved to Luxembourg. I chose to study at Bangor University primarily because of its scenic location between Snowdonia and the sea. This was perfect for me as I wanted to live somewhere small. “During my studies I was lucky enough to secure and internship at the Royal Botanic Gardens of Edinburgh, which was an amazing experience. I also did quite a lot of voluntary work such as beach cleaning and helping out at Treborth, the University’s botanic gardens. Yi-Wen will start a PhD at the University of Bath in September where she will be working on Cassava in the field of crop improvement and potential for biofuel.